These are the prototype prints of the final graphics in Nightlancer for the Nightlancers themselves! There are 8 unique Nightlancers in the game with their own abilities, assets and opportunities. Each Nightlancer card has the starting levels in the six main ability scores Covert, Streetwise, Technical, Melee, Gunfight and Marksman and a unique special ability for each Nightlancer. It has their Health and Resolve levels, which are used to withstand the physical and mental stresses of the Nightlancer life. They also set out the starting status at the beginning of the game. In addition the Nightlancer card has the Ideals track which is used to track the current status of a NIghtlancer’s Ideals – their standards, integrity, values. They do not represent one specific set of values, instead it represents how they keep to their individual values. 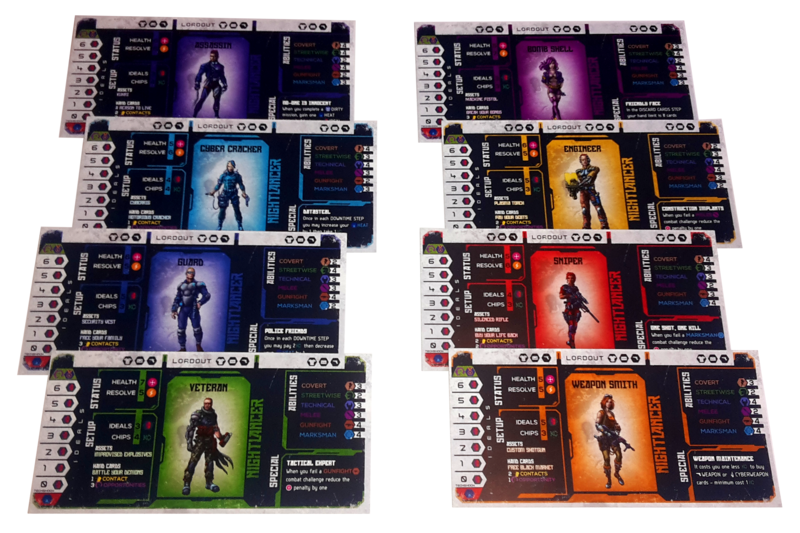 The card also has the Loadout section, where you place Armour, Gear and Weapon cards in preparation for a Mission. You can only carry so much or it would just be a burden, so pack wisely! There are 8 Nightlancers included in the game currently. During the Nightlancer Kickstarter it will be possible to pledge as a True Nightlancer to be immortalised as an additional Nightlancer character! A True Nightlancer backer will have the option of being featured in the Nightlancer illustration itself and will have input on the style and background of the character.